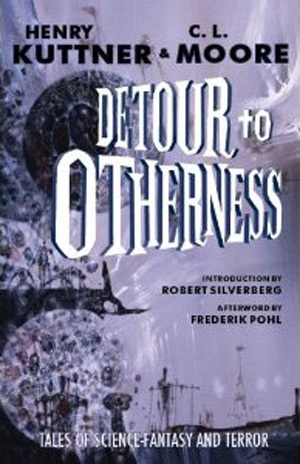 Limited to 75 copies, this “grandmaster edition” of Detour to Otherness is signed by the author of the introduction Robert Silverberg and the author of the afterword Frederik Pohl on a full-bleed plate of the Richard Powers cover artwork (the original image was cropped for use on the dustjacket). This edition is also an extra special treat for admirers of both Henry Kuttner and C.L. Moore: housed in the slipcase is a 94-page chapbook, OTHERNESSES. The chapbook is also signed by Malzberg. 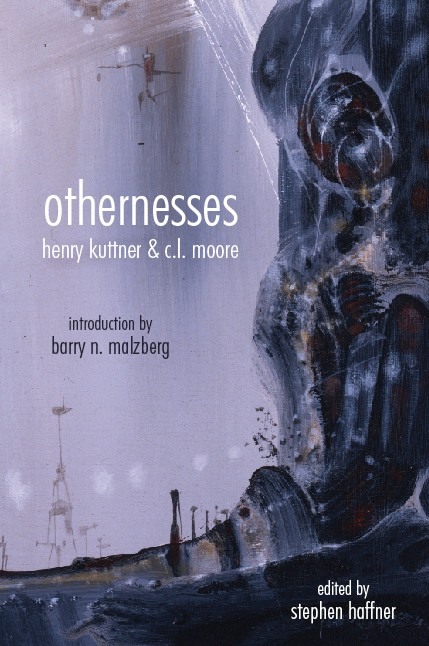 In 1961, Ballantine Books published Bypass to Otherness, a paperback collection of some of Henry Kuttner’s (and C. L. Moore’s) best short stories. Several selections were drawn from Kuttner’s popular series such as the “Hogbens” (comedic otherworldly hillbillies living in America), “Gallegher Galloway” (scientist who invents technical marvels only when intoxicated), and the “Baldies” stories eventually collected in Mutant. Bypass was projected as the first of three “Otherness” collections of Kuttner’s short fiction. Return to Otherness followed in 1962 with 8 more stories. And then . . . nothing. The third “Otherness” collection never appeared. Now, almost fifty years later, Haffner Press announces DETOUR TO OTHERNESS: a massive hardcover assembling the contents of both Bypass to Otherness and Return to Otherness, and adding 8 additional stories selected for their scarcity, quality, and sheer entertainment value. Grand Masters Robert Silverberg and Frederik Pohl provide introductory and afterword materials to the book, and the whole affair is decorated with an unpublished painting by Richard Powers. "DETOUR TO OTHERNESS shows the usual care and craftsmanship of all of Haffner’s titles. The core of the book is the 1961 Bypass to Otherness, the famous paperback collection of many of Kuttner and Moore’s finest stories, drawing from Kuttner’s popular “Gallegher Galloway” series, featuring a quirky scientist who invents technical marvels only while drunk, his comedic “Hogbens” stories of otherworldly hillbillies, and the “Baldy” tales about mutant telepaths. It was followed by Return to Otherness in 1962, containing eight more stories. Both paperbacks are valuable collector’s items today. DETOUR TO OTHERNESS assembles both Bypass to Otherness and Return to Otherness, plus eight additional stories “selected for their scarcity, quality, and sheer entertainment value. "Kuttner’s “Gallegher Galloway” stories were collected by Paizo inRobots Have no Tails (reviewed for us by James Enge), and Paul Di Filippo recently reviewed Moore’s seminal collection Judgment Night for us . . . But both books are dwarfed by this thick new volume. If you’re a fan of science fantasy, you’ll want to add this to your collection. It’s available . . . for just $40 for an archival-quality hardcover packed with 568 pages of classic fiction." "1961, I bought Ballantine Books Bypass to Otherness, a paperback collection of some of Henry Kuttner’s and C. L. Moore’s best short stories. I loved it! Some of my favorite stories were selections from Kuttner’s popular series such as the “Hogbens,” funny otherworldly hillbillies living in America, “Gallegher Galloway,” the scientist who invents incredible machines only when intoxicated (whose adventures have been collected inRobots Have No Tails), and the “Baldies” stories eventually collected in another Ballantine Book: Mutant. Bypass to Othernesswas projected as the first of three “Otherness” collections of Kuttner’s short fiction. Ballantine published Return to Otherness in 1962. Another great collection! The third “Otherness” collection never appeared. Now, 50 years later, Haffner Press has publishedDETOUR TO OTHERNESS: a grand collection that includes bothBypass to Otherness and Return to Otherness, with eight additional stories. Robert Silverberg provides an informative Introduction and Frederik Pohl writes a nostalgic Afterword. If the cover looks unfamiliar, it’s because this is a formerly unpublished painting by Richard Powers that matches the striking Powers covers on Bypass to Otherness and Return to Otherness. It’s great that Haffner Press has brought these wonderful forgotten stories out in such an attractive package. All in all, DETOUR TO OTHERNESS is one of the best books published in 2010. . . . You will love this grand volume . . . It’s everything a small press book should be."